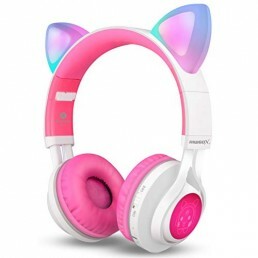 Brookstone Wireless Cat Ear Headphones Bluetooth Headset (Color Changing). Feline-Inspired Sound Guaranteed to Turn Heads Change light color to match your mood or your outfit (blue, green, purple, orange, white, red, yellow and pink) Listen to the ear cups and ear speakers separately or together Speaker and ear cup light functions work independently of each other Over-the-ear cushioning for noise reduction and secure fit Built-in microphone for taking phone calls Party For One–or Let Everyone Join in the Fun. Slip the cushioned ear cups over your ears and they conform to your head to better block out background noise and let you enjoy all the rich, vibrant sound you expect from premium headphones. Flip the switch and now your private sound studio doubles as a party-rocking sound system. We’re not done there–then comes the light show, courtesy of color-changing ear cups and cat ears. The Story Behind The Wireless Bluetooth Car Ear Headphones We made these headphones to combine our two favorite sounds experiences into one. Listen on your own through the cushioned ear cups, or turn on the cat ear speakers to share the playlist with everyone. (Or do both at the same time!) And because we don’t do anything by half, we decided to make these headphones real head-turners by adding lights everywhere we could. The result is a stand-out way to enjoy your music, any way you like. 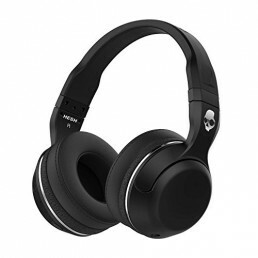 Specs: Headphone Audio 20Hz-20KHz frequency response 32 Ohm impedance 40mm drivers Cat Ear Speaker Audio 200Hz-18KHz frequency response 32mm drivers In the box: Wireless Cat Ear Headphones 4-foot detachable headphone cable (3.5mm) USB recharging cable Protective carry case The Bluetooth word mark and logos are registered trademarks owned by Bluetooth SIG, Inc. and any use of such marks by Brookstone is under license.